Most of us have important documents that need to be stored securely, but to which we also need easy access. Whether at home or traveling, we want the comfort of having those documents with us without the worry of losing them or not controlling who can see them. Dashlane Premium and Premium Plus users can use Secure File Storage to do just this. Secure File Storage allows you to use the same powerful encryption and security infrastructure used to protect your passwords and Secure Notes, but now to encrypt and store your sensitive documents within your Dashlane app. Wherever you have access to your devices, you now have access to those files. And as your encrypted data is backed up by Dashlane, you never have to worry about losing your data. How much storage am I allowed, and what kind of documents can I store? To upload a file to your Dashlane in the desktop application, you need to create or open an existing Secure Note to which you want to attach your file. Then click on "Attach a file" on the upper-right of the note, which prompts you to select the file on your device that you wish to upload. 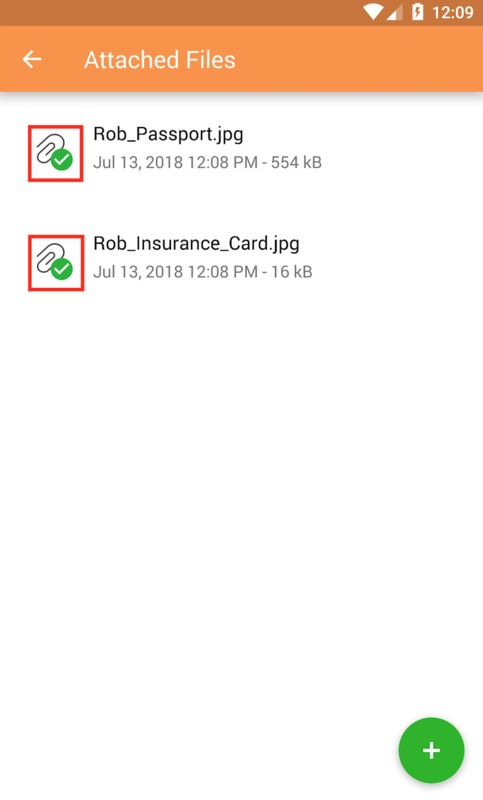 Once you have attached a file to a Secure Note, they are listed under the "Attached files" tab in the note. Once you have saved your note, the icon in your list of Secure Notes will show a small paperclip to indicate that the note now has an attachment. For example, if you were travelling abroad, you might create a note called "Travel Docs" and attach to it scans of your passport or other important documents. 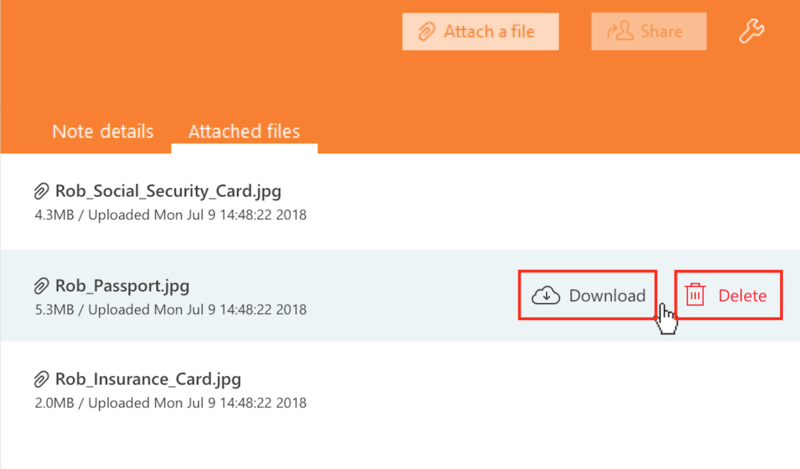 To download a file, move your mouse over the entry for that file and click on the option to "Download" that appears on the right. You will be prompted to choose where to place the file on your device. To delete a file, move your mouse over the entry for that file and click on the option to "Delete" that appears on the far right. Be aware that if you delete a Secure Note, you will delete the files attached to it. Be sure you want to delete your files before doing so, as this cannot be undone. Please note that for security reasons, we currently do not allow you to preview your attachments within Dashlane. To view them you must download them. Note also that for now you cannot share Secure Notes with attachments. Note that secure files are stored in the cloud, so if you have turned your Sync off, keep in mind that these files constitute an exception to that setting. 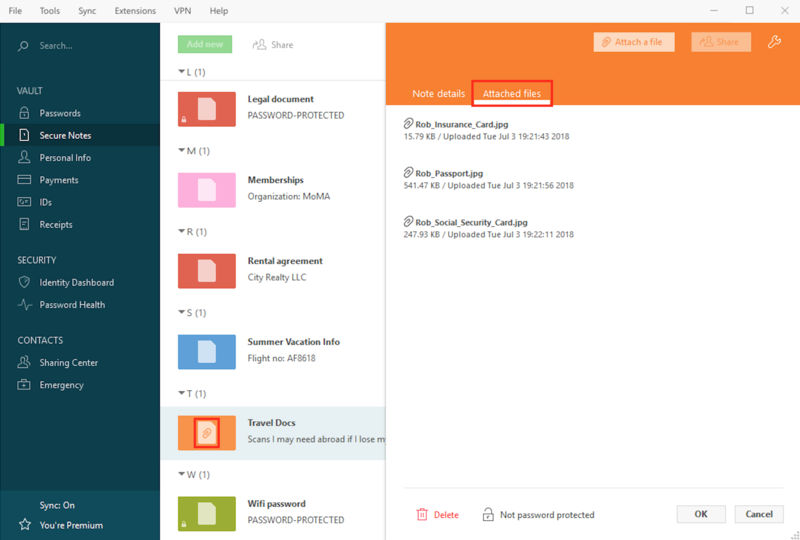 Finally, if you are no longer a Premium or Premium Plus user and have securely-stored documents, you will not be forced to delete them but cannot add new ones. To store a secure file on your iOS device, create or open the existing Secure Note to which you want to attach your file. Tap the paperclip icon in the menu bar at the bottom of the screen to open the page that lists the files attached to the note. There, tap the white plus sign in the upper right-hand corner. This will prompt you to select the file you wish to upload. Once you have attached a file to a note, the icon for that note will show a small paperclip to indicate that it has an attachment. 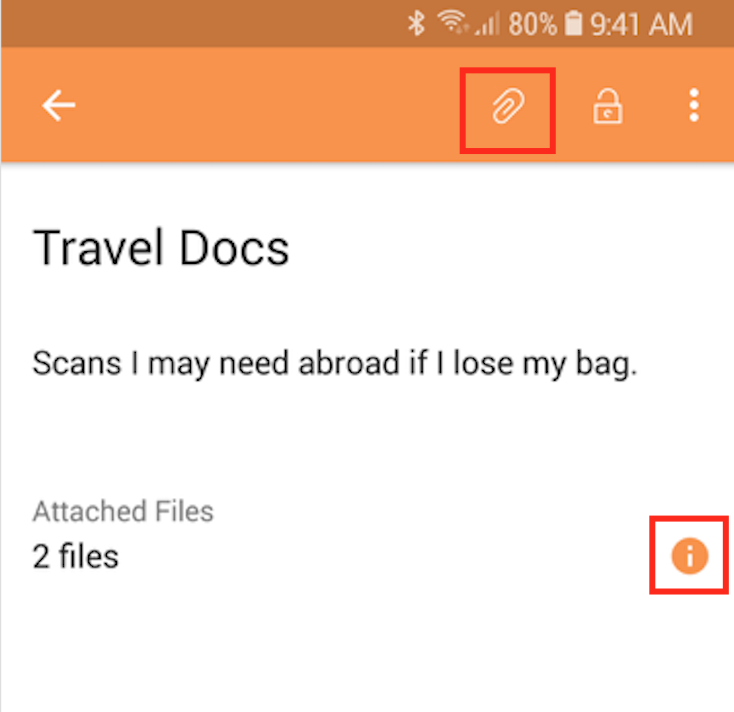 To open or delete a file, tap on the file in the list of files attached to the Secure Note. If you choose open you will be prompted to choose where to display or download the file. For security reasons, we currently do not allow you to preview your attachments directly within Dashlane. If you choose delete you will be asked to confirm, as deletions cannot be undone. Note that for now you cannot share Secure Notes with attachments. Note also that secure files are stored in the cloud, so if you have turned your Sync off and wish to use secure files, keep in mind that these files constitute an exception to that setting. Finally, if you are no longer on a Premium or trial plan and previously created secure files, note that you may keep those files but simply cannot add new ones. To store a secure file on Android, first create or select the Secure Note to which you want to attach your file. Tap on the paperclip icon at the top of the screen, or else the small, round information icon on the right side of the screen, to open the page that lists the files attached to the note. There, tap the green circle with a plus sign on the lower right. This will prompt you to select the file you wish to upload. To open a file, first download it by tapping on the file. The file will show a small green circle with a white check mark to show it has been downloaded. Then tap again, and choose where you will open the file. For security reasons, we currently do not allow you to preview your attachments directly within Dashlane. To delete a file, tap and hold the file you wish to delete to select it, then tap the trash can icon at the top of the screen. Please be sure you wish to delete before doing so, as deletions cannot be undone. Finally, if you are no longer on a Premium or trail plan and previously created secure files, note that you may keep those files but simply cannot add new ones. Dashlane allows you to store up to 1 GB of files within your account. Note that individual files are currently limited to less than 50 MB in size.